The first reaction of anyone who saw my cake last week seemed to be “Oooh, Mint Aero!” So, knowing how much people love this chocolate bar gave me the idea for this recipe… I just knew Mint Aero Cheesecake would be a WIN. This is a baked cheesecake, in keeping with every other cheesecake I’ve ever made. I don’t seem to have much success with things that require fridge time to ‘set’ such as an unbaked cheesecake. I think I’m just far too impatient to wait! At least with a baked cheesecake you can dive in once it’s chilled. The slight complication (which anyone who has ever made a baked cheesecake will sympathise with) is how do you know when to take it out of the oven? Well, my ‘knights in shining armour’ from Buy Catering came to my rescue on this one as they sent me a wonderful Thermapen to review this week. 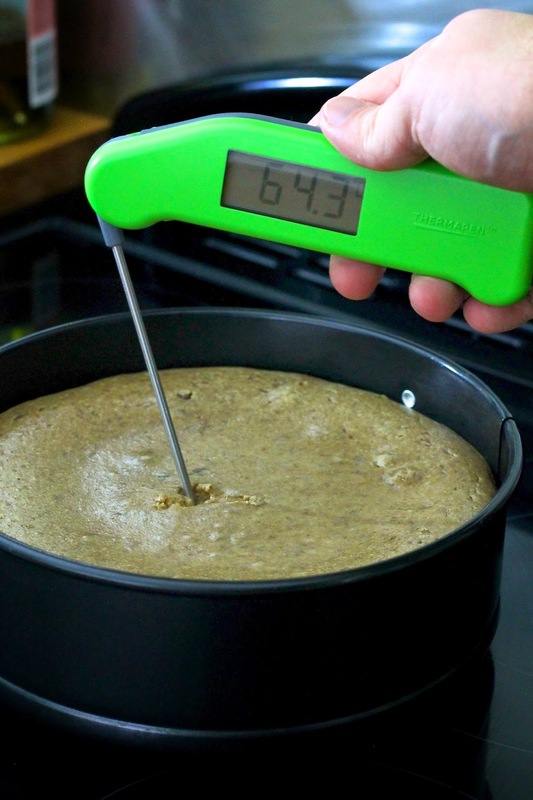 Thermapens are widely regarded as the rolls-royces of food thermometers as they are super quick and very accurate. 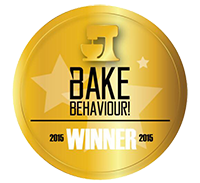 I loved using this and will use it for ALL baking from now on to be sure everything is baked to perfection! The magic temperature for a cheesecake is 65.5ºC. Once the very centre reaches this temperature, it is cooked. If you heat it to more than 70ºC then the cheesecake will overcook and crack on top. If you don’t have a thermometer then just cook it until the sides are puffy and golden and there is still a wobble in the center. If you overcook it a little and get a few cracks, don’t worry because the chocolate ganache hides a multitude of sins! You will see that I cheat and leave the bottom of my tin on the cheesecake to serve. I always do this unless it’s a really posh event… It’s mainly because I’m such a wimp, really; I’m far too scared of ruining it by trying to take the bottom off. OK, so I can hear you screaming at me for the recipe at this point so I’ll shut up and give it to ya! Don’t forget to share pics on my Facebook page or on Twitter if you make it, I’d love to see. A deliciously decadent Mint Aero cheesecake, topped with a chocolate ganache and finished with whipped cream and more crumbled Aero! 1. Mix the chocolate digestive crumbs and melted butter together until a ‘wet sand’ consistency, then push down hard into the base of a greased and lined 20cm springform tin and place in the fridge. 2. Mix all the cheesecake ingredients except the chocolate together until smooth and lump-free, then stir in the melted chocolate until well combined. Pour over the chilled base.3. Bake in an oven preheated to 160ºC for around 45 minutes. It is done when the internal temperature of the very center is 65.5ºC or when the edges are puffed and brown and the center has a slight wobble. Once cooked, remove from the oven and run a knife around the edge of the tin to stop the sides from sticking. Leave to cool to room temperature.4. Whilst the cheesecake is cooling, make the ganache by pouring the double cream into a saucepan and heat until simmering. Pour this over the finely chopped chocolate and leave, without stirring, for 30 seconds to begin to melt. Stir SLOWLY until it all comes together into a lovely ganache. Stand to one side to cool.5. Once the ganache and cheesecake are at room temperature, pour the ganache over the cheesecake so that it is completely covered. It should be liquid enough to find its own level. Place in the fridge for AT LEAST 2 hours to chill.6. Top the chilled cheesecake with the whipped cream, piping if you feel like it. Sprinkle with the remaining Aero and serve! Prep time: 15 mins Cook time: 45 mins Total time: 1 hour, plus cooling and chilling time Yield: Around 8-10 portions, this is RICH! Cosmocheese from Oh La Vache! Disclosure: I was sent the Thermapen by Buy Catering for free to review. I was not paid or required to write a positive review and any opinions expressed are my own. Oh wow! That looks amazing Kevin. I like you am a coward and tend to leave the base on. Thanks for linking to me. Stumbled, pinned, tweeted!!! Oh and nifty tip about the temperature! Thank you so much Jac and I'm glad you leave the base on too, doesn't make be feel quite so wimpy! I love the whole temperature thing. Little known fact is I am actually colourblind so struggle sometimes to tell when things are done. The thermapen will be a godsend for that! I was also really surprised at the look of the cheesecake when it was up to temperature, it was wobblier than I would have felt comfortable removing from the oven in the past but it was actually baked to perfection! 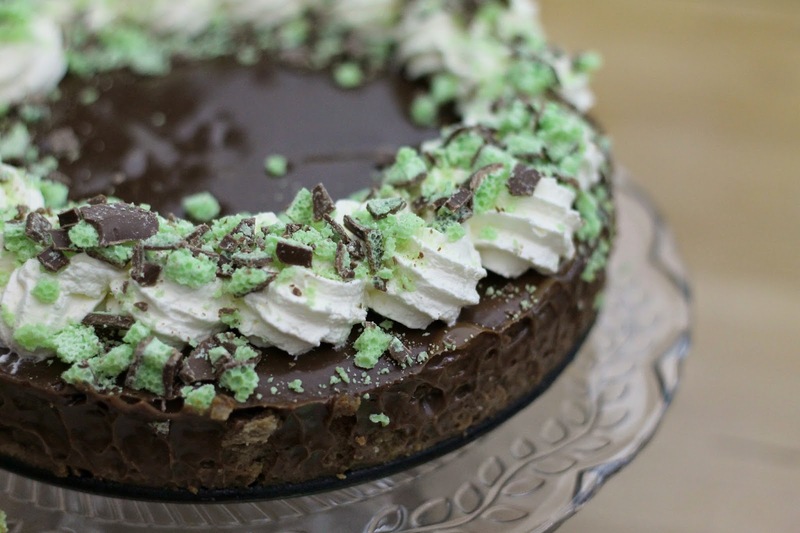 Chocolate and mint is one of the greatest combos ever, as well as this cheesecake! Quite interesting info about temperature, but I am too lazy to control it with a thermometer. I believe in my intuition:) My respect to you for doing it right, though! Thanks Ben. My intuition needs a bit more work, I think! That is one utterly stunning cheesecake.. even the odd green colour inside has me intrigued!… as I said, i've never made a cheesecake before but I am sorely tempted to give this ago, even if its just for a slice! This looks so delicious, I imagine there was not much left once you tried it! Wow – this looks awesome! (Even if a little green…) Chocolate, mint and cheesecake – is there anything not to love? I don't think so, Craig. It's the cheesecake everyone should love! This is the cake of foodgasms K. Trust me I am drooling.